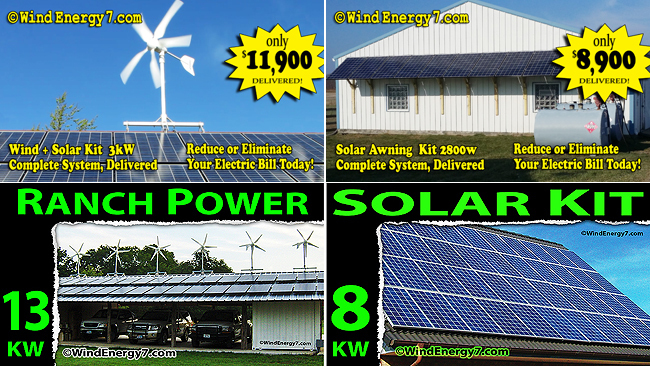 >> When you say a kit is 3kw are you meaning 3kw per day or hour? 3kW (kilowatt) is the rating of output at full wind and sun. 3000 watts or 3kW is its power potential rating. The kwH (kilowatt hour) is the measure that we pay our electric bill by. That is 1000 watts or 1kW, sustained for an entire hour. So, answer is a 3kW can and will do 3kW per second but only at full sun and wind. And the estimating we have to do for each site includes many factors. Its not sunny at night and its not always windy. So, we use historical and geographical weather data to judge a geographic potential. We use a site analysis of your satellite image to see what your roof angles are, predominant wind direction, proximity to trees, buildings, or other obstructions, and other details that will affect your actual yield. Lastly we use real world experience of installing and supporting hundreds of wind turbine systems all over the world. This is one of the main reasons I invented the hybrid Solar/Wind systems underneath my RoofMill™ and TowerMill™ designs almost 10 years ago. In explaining my technology I coined this trade marked phrase, a rule of thumb that became the doctrine, called Peak & Weak™. My company's aggressive, rapid development with a clear understanding of BOTH potential and limitation resulted in the best green energy systems made. One design goal was to counter seasonal peaks and valleys of wind and sun resources. Wind VS Solar, The two resources actually offset each other seasonally. Thus, together, they balance into a synergy of reliable power over the year. As you see in my illustration below, the strength of one offsets the weakness of the other. Solar is peak in summer, weak in winter. 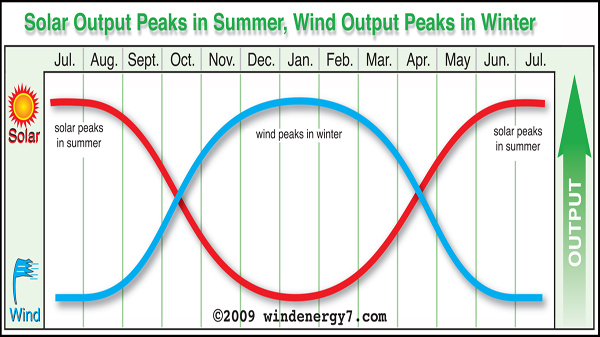 Wind is peak in winter, weak in summer, (Peak & Weak™). Each are seasonally opposite to perform together year around. Peak & Weak™ Doctrine.. is something I believe in very strongly. My absolute understanding that and solar only, or a wind only system, is but a HALF a real system. First, I pioneered rooftop wind power by solving the problems of deploying urban wind power. Second, I pioneered the development of the best hybrid solar/wind systems anywhere. My RoofMill™ and TowerMill™ systems now feed power daily into every major grid in the united states. With customers, dealers and installers in over 40 states the RoofMill™ and TowerMill™ systems have been very successful. I would encourage you to look at other posts in my forum where I post Q & A like this. You will learn a lot of stuff reading through my customers questions and the responses I give all the time. Also, I send out tutorial articles in my email list a couple of times a year explaining site analysis for wind and solar.